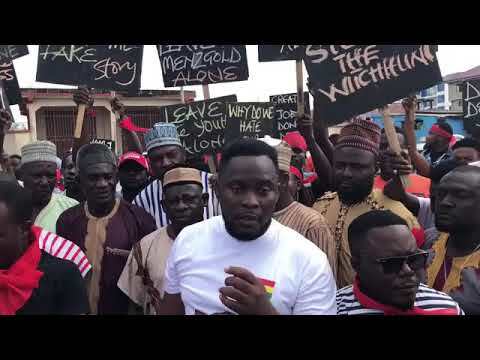 Aggrieved customers of gold trading company, Menzgold Ghana Limited, are threatening a mammoth demonstration to the Jubilee House. Their threat follows Securities and Exchange Commission’s (SEC) directive that the company halts with immediate effect, its gold trading activities. In a letter issued September 7, 2018, the Commission said it has found, following investigations into Menzgold activities that the firm, does not have the license to trade in gold collectibles. The Commission further explained that it has interacted with representatives of Menzgold and has come to the conclusion that the aspect of Menzgold’s business which involved the purchase and deposit of gold collectables and guaranteed returns is a capital market activity under Act 929 without a valid license issued by it. But the angry customers, mostly market women at Kasoa in an interview on Adom News, appealed to President Akufo-Addo to intervene. The customers who hit the streets Friday morning to register their displeasure have given government up to next week to act or face their wrath. “Menzgold is creating jobs and we have traded with them for some time now. We always deposit gold and if you shut the company, how do you expect us to live. We are on the streets today because we are not happy,” an angry market woman said. “If Akufo Addo refuses to listen to us by next week, we will go to the Jubilee House naked for him to know how serious we are,” they charged.